Despite the downturn in the number of veterans, the VA here has been seeing its enrollment grow, as a higher percentage of veterans sign up for VA care. North Carolina is home to two of the world’s largest military bases — the Army’s Fort Bragg and the Marine Corps’ Camp Lejeune — but the state’s population of veterans is steadily declining. Last year the number of veterans in North Carolina dropped to about 656,000. That’s down nearly 90,000 from a decade earlier, according to US census bureau estimates. The number has steadily fallen from a plateau a decade ago. That’s despite the substantial rise in the state’s overall population, according to a new report from UNC. 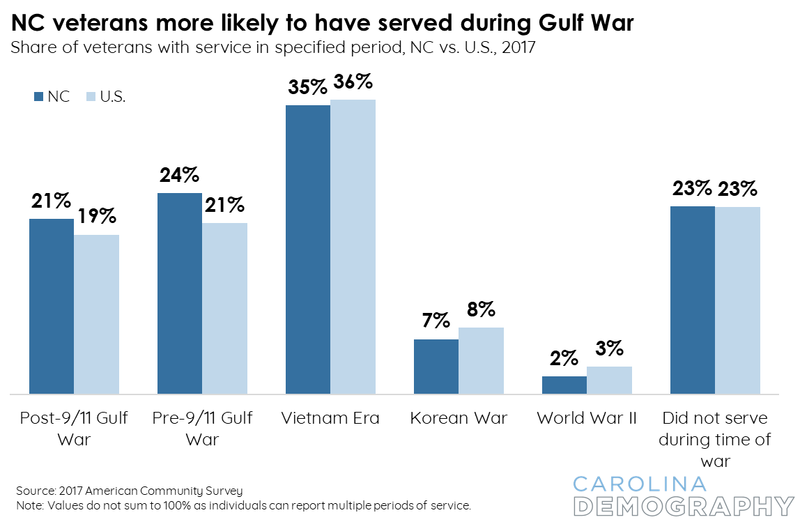 A big reason that the population is falling off so much is that the veterans of the draft-fueled buildup during the Vietnam War era now dominate the veteran population, but are “aging out ” said Rebecca Tippett is the director of Carolina Demography at the Carolina Population Center. The veteran population is older than the average, she said. “The result of that is that you’re going to see much higher mortality rates, and overall population decline because young veterans are not replacing older veterans at a fast enough rate and are not likely to,” Tippett said.